Ever since it manufactured its first telescope in 1960, Celestron Telescopes has grown into one of the world’s foremost optics manufacturers, and now enjoys brand-name recognition among serious amateur astronomers for their superior optics, impressive design, and progressive technology. They are not without reason recognized as a world leader in the design and manufacturer of premium quality optical products which include computerized and non-computerized telescopes and associated accessories. Their innovative telescopes and optics continue to receive countless industry and consumer media accolades, which contribute to an already notable list that includes awards for product innovation from many leading publications. The The Celestron Collimation Eyepiece is designed for exact collimation of Newtonians and of great help for aligning Schmidt-Cassegrains. This special eyepiece fits into 1¼" focusers or diagonals. If you travel out and about with your scope a Celestron Power Tank is a handy extra that will enable you to use it anywhere, packed with a number of usefull features. 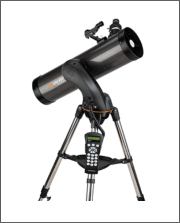 The Celestron C5 spotting scope is an ideal choice for the serious astronomer. Weighing in at just six pounds it is a totally portable visual and photographic device that functions effectively in any viewing location. 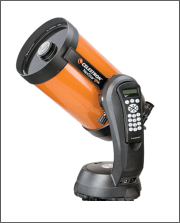 Celestron continue to research and develop innovative products which is great news for all amateur astronomers. many at discounted prices. It's always worth checking out the latest offerings. 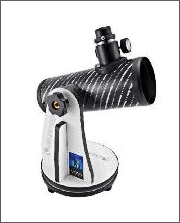 The AstroMaster produces bright, clear images of the Moon and planets. If you want to add a level of sophistication to your office, study, library or drawing room then this type of telescope is the ideal choice. These telescopes have been described as tomorrow's next generation of computerized GPS SCTs. These scopes have been designed for superior astrophotography performance while maintaining portability. Being a portable and lightweight(under 2kg) table top design it makes it easy to store, transport and setup. This series from Celestron brings a completely new generation of computer automated technology. The Celestron Powerseeker 114 EQ Telescope opens up a whole new way for you to see the wonders of the Universe. Skyprodigy Telescopes are a truly revolutionary product with ground breaking technology and an end result of years of telescope advancements. This range of EdgeHD aplanatic Schmidt telescopes are designed to produce aberration-free images across a wide visual and photographic field of view. Introducing the C6-SGT, the newest member of the Advanced Series family. Unparalleled performance. 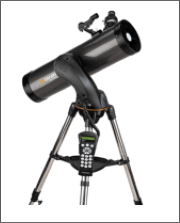 Mounted on the Advanced GT Series computerized mount, this telescope has some high performance software and hardware features. A counterweight, latitude scale, setting circles and slow motion controls on both axes are standard.